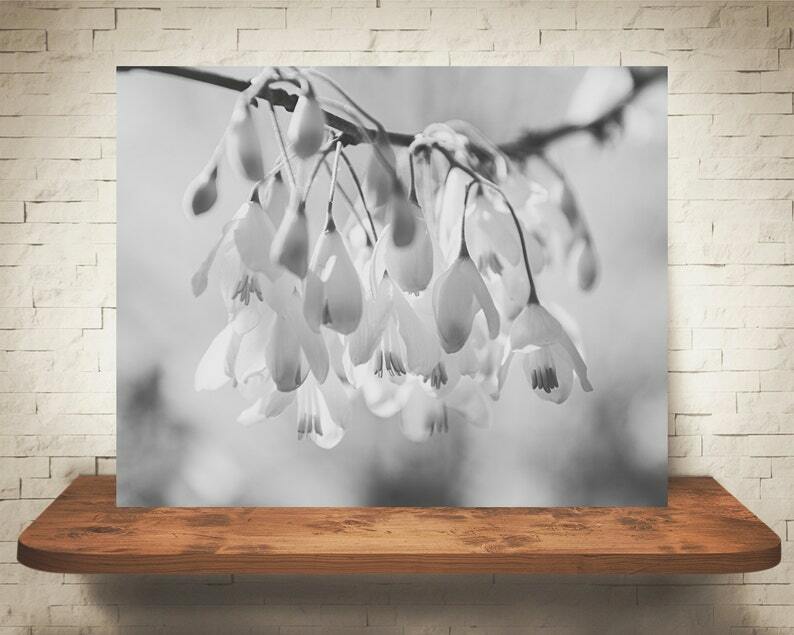 This fine art photograph black and white print is of small white flowers from a Snowbell Tree. My photographs are great for home decor. You can even give them as house warming gifts. The 5x7's look great in a frame for your bookshelf, fireplace mantle or desk. This would be lovely in your kitchen, living room, bedroom or girls room. All my prints are made from images that are taken by me. I only use professional photo labs that print on archival paper. Please be aware that the print you receive may differ in color slightly from the image you viewed on your screen due to each monitor having different settings. Photo will be shipped directly from the professional lab. That way it is only shipped once. My photographs come unmatted and unframed to allow you to pick out the colors of the matte and frame you would like. *All images belong to Christine Beadnell from Shutter Tree Photography. Images are my artwork please do not copy or reproduce. A beautiful photo! A new favorite of my collection of Chrissy’s photos. Thank you so much . I am so happy with this purchase. I also received the Church one and that is a beauty too.